Sponsorship « Talkler. Email for your Ears. Our sponsors keep Talkler free for everyone, and we’re proud to partner with some of the best-known national brands, ad agencies, leads marketers and mobile ad networks — to connect them to the growing Talkler community. Talkler users represent a powerful demographic: successful and driven, on-the-go, with a “mission critical” connection to their email. Advertisers and aggregators whose products and services deliver real value to this demographic will get unmatched access with Talkler Labs. Talkler’s unique feature set allows for a multi-modal experience that significantly outclasses any other mobile publishing model we’re aware of. 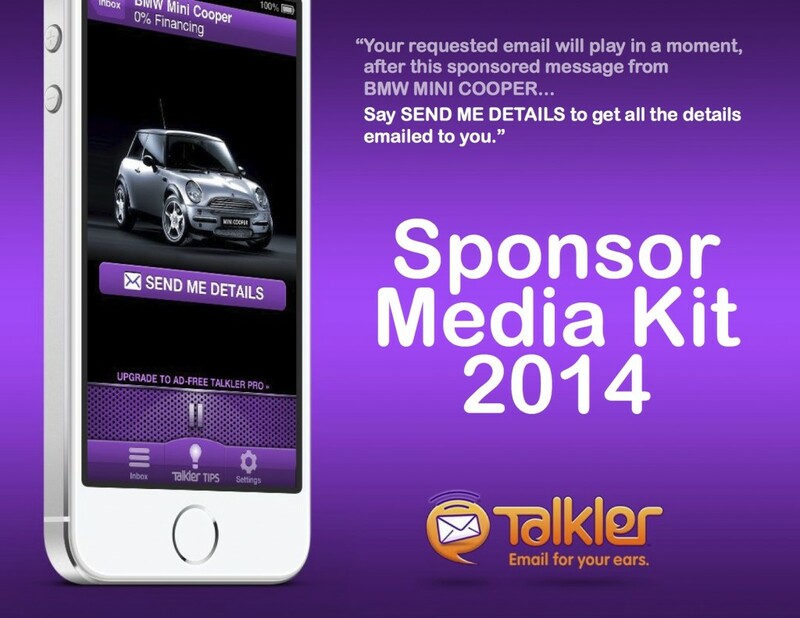 Sponsorship messages are seen full-screen and read aloud in familiar Talkler voices. Messages are also empowered with instant-response capabilities. With a single touch or spoken command, Talkler users request more information, inviting our sponsors to contact them via their verified, up-to-date, personal email address. There’s no easier way to promote a brand or new product and enrich a prospecting database with some highly-qualified consumers, road warriors, and businesspeople. We welcome the chance to work with you to deliver powerful relevant messages and offers with real value to our community. Contact Jeffrey Korn today to learn more and begin a profitable new relationship with Talkler.